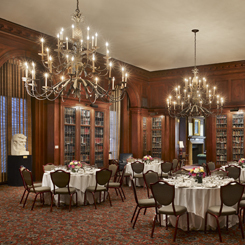 The Library Lounge, the twin counterpart to the Lincoln Memorial Room, is a handsome room done in quartered oak. This room contains the remainder of the historical book collection. Two large chandeliers lights the room, each topped with pineapples, an 18th century symbol of hospitality. The extraordinary marble bust of Lincoln was done by sculptor, Raymond Barger. Of note when exiting the room are the two beautiful marble statues, on the left is the "Oldalisca" dated 1893 and on the rights is "Al Amor Mio" or "To My Love."